A bad day on the water is still better than a good day at work. For those who work at Moose Landing Marina in Naples, their work is on the water so they get the best of both worlds. “We sell family fun,” said general sales manager for Moose Landing Marina Will Monson. They are the largest seller of pontoon boats in Maine and the new dealer for Ranger Tugs, the only one in the state. They offer a full-service marina that can take a customer from the purchase of a boat to mooring it and everything in between. Owned by Steve Arnold, Moose Landing is all about the family feel and breeding the fun lifestyle for their customers. Arnold encourages his employees to get out on the water and enjoy the Maine lakes connected to the marina, which is located on Brandy Pond, but is accessible to Long Lake and Sebago Lake. With 43 miles of lake access from Moose Landing, the marina is perfectly situated for enjoyment on the water. “I tell my employees and customers to hit the sandbars. I work and boat with them. It’s not just the sales, we believe in the stuff we sell.” Arnold said. The marina has been in the same location since the 1950s and became Moose Landing in 2003. Arnold purchased the marina in 2013. “Customer service is our strong point. Customers are treated with respect,” Arnold said. Moose Landing offers a long list of boat services like mechanical work, Fiberglass-ing, reconditioning, electronic services, boat hauling, indoor and outdoor storage, winterization and upgrades and customization. Moose Landing sells six brands of pontoon boats. It has an experienced sales staff that can help a customer find the perfect fit. They ask a lot of questions about activities and what the boat will be used for. There are six to eight new boats in the water at any given time for test drives. The newest boat for sale at Moose Landing is the Ranger Tugs, a crossover type vessel that is well appointed and has many amenities for day trips or longer overnight excursions. They also have entry level boats. They sell Regal Boats, Supra and Moomba ski boats, Hurricane deck boats, top of the line Premier Pontoon boats, Palm Beach pontoons, Sweetwater Pontoons and more. Moose Landing earns many awards in the sales arena earning high customer satisfaction index scores and landing in the top five in the country for dealers. Moose Landing has a commitment to service as well. “All technicians go to school and are certified. Training is expected and that is dovetailed into customer service,” Arnold said. The company has 17 employees, but grows to 30 in the summer with seasonal help. “We hire good people,” said Moose Landing Marina general manager Jason Allen. Moose Landing also sells aluminum docks, boat lifts and does brokerage from their location at 32 Moose Landing Trail off Route 302 in Naples. There is also a store for boat gear. Not a boat owner yet? Moose Landing rents a total of 68 boats, 28 from the Naples location and they have a satellite location at Point Sebago Marina. The rental area is run by manager Jean “The Warden” Martin. Moose Landing attends many boat shows around New England drawing boaters to Maine and the region so you explore the many options. Moose Landing will drop off boats in the spring and pick up boats in the fall from the smaller lakes in the area. Customers pay for the service, however, the ease and convenience is great for those who can’t launch a boat by themselves. The marina handles approximately 1,000 boats a season. Moose Landing Marina has 195 slips and valet service for those who don’t want to keep their boats in the water. Boat owners can call ahead to have their boats ready for a day on the lake. When they arrive back at the marina, they leave the work to Moose Landing, who will put the boat away until the next outing. The marina provides fuel and pump out services and a club house with a bath house and showers. “We promote family fun on the water,” said Monson. Who assures those looking for boats that “yes, you will use it.” He recommends that those interested in boating take a rental boat out for the day to see if they like it. “No one hates it,” he added. Arnold wants Moose Landing to be front and center in people’s minds when it comes to trading in or up. And with their breadth of services, customers can benefit from stopping by to see what they have to offer. Moose Landing’s sister company, also owned by Arnold is Yarmouth Boat Yard. Yarmouth Boat Yard is a smaller marina with a few rentals and deck hands. They also have a wide selection of boats. 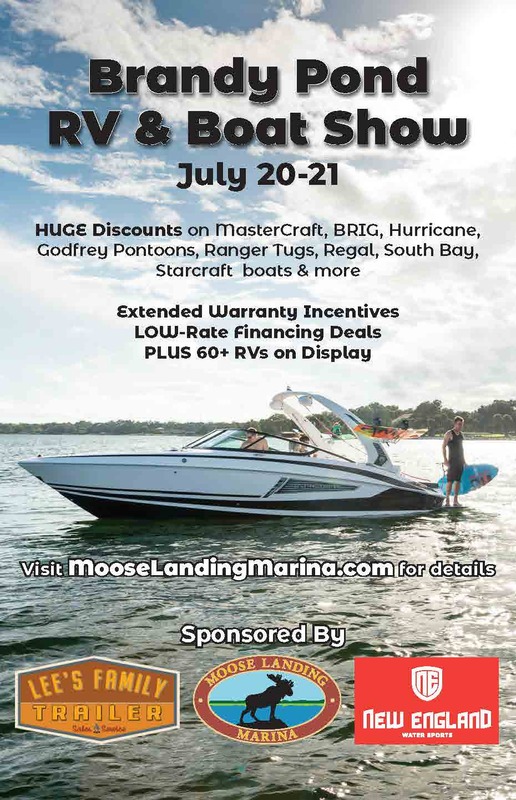 For more information, visit www.mooselandingmarina.com or find them on Instagram, Facebook, Twitter, or call them at 207-693-6264.